The superior 4-star Melia Calvia Beach Hotel, Magaluf, Mallorca, is a popular choice for golfers wanting the convenience of Magaluf in a quieter and more upmarket setting. 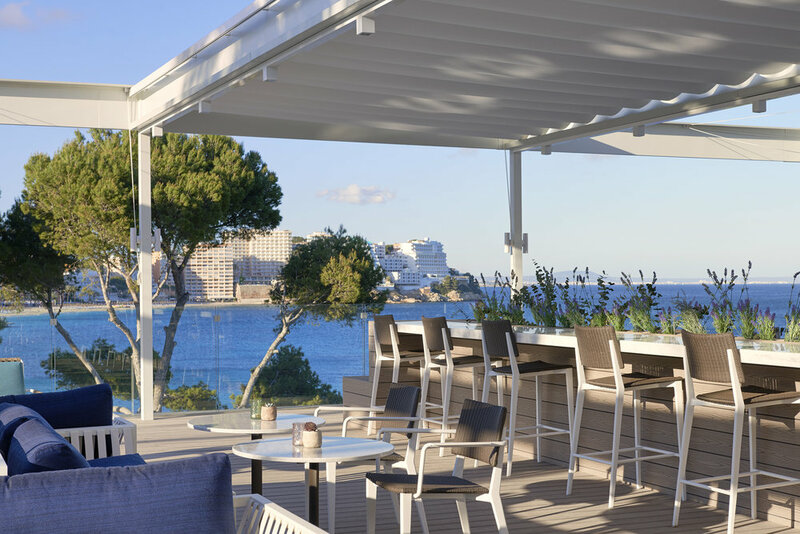 The new Melia Calvia Beach also offers 'The Level', which provides the most discerning golfers with a variety of enhanced services, including a private area for exclusive check-in, access to The Level Lounge, and an exclusive pool and sun deck. Dining options include the Mosaico buffet restaurant, which has an outdoor terrace, the Casa Nostra Italian Restaurant, and the Pez Playa Restaurant. Five pools, some of them with spectacular sea-views, a fully equipped gym & a YHI spa, complete the offer at this hotel. The Melia Brand is known for offering quality, and value for money. So, we're certain that this hotel is going to be a great choice for golfers wanting the convenience of Magaluf with the standards and service offered by a superior 4 star hotel. The breakfast and dinner buffets offer an incredible selection of tempting dishes, and staff are readily available to take any drink requests. It's location, in a great spot overlooking the bay, is only a short walk from the nearest bar, and just a few minutes further to the centre of the resort. Limited parking, is available at the hotel (at additional cost) and on the street.